Modern quilt designs sometimes turn up in unexpected places. 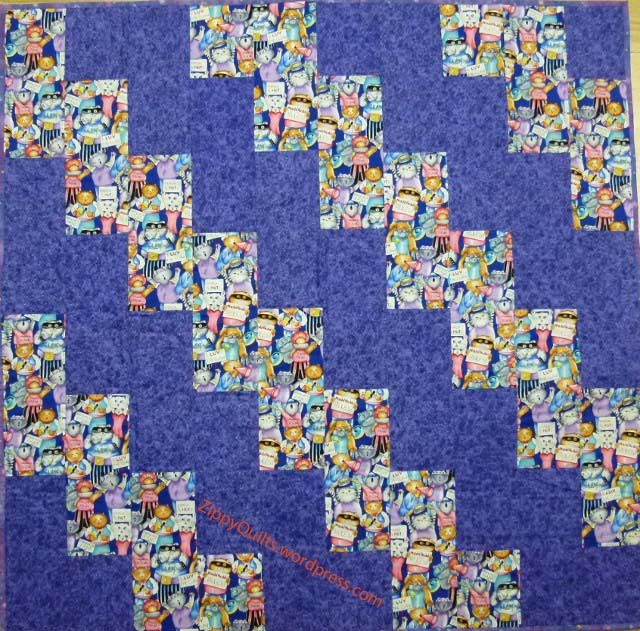 “Turning Twenty Again”, which has been around for a while, is an easy, fun quilt that can be very modern in appearance. Tricia Cribbs, who designed the Turning Twenty quilts, says she didn’t set out to design a modern quilt, she just wanted something that showed off her fabrics to good advantage. Whatever her intent, her quilts are compatible with the modern aesthetic. I’m showing some of my examples here, and there are beautiful pictures of Turning Twenty and her other designs on her website as well. I’ve seen “Turning Twenty Again” made up in a variety of fabrics, by quilters from beginner to professional, and every version looked great. Leaving off the border makes it instantly more modern. I like to start with 1 to 1-1/2 yards of focus fabric, then choose FQs to coordinate with it. Think about those fun fabrics you “just had to have” and now don’t know what to do with. Think of all those FQs (fat quarters) in the closet! By getting the two together, you can make a very easy modern quilt using “Turning Twenty Again”. Tricia’s patterns also make efficient use of FQs–almost no leftover scraps. Here’s a lap quilt that started with a yellow print I loved. 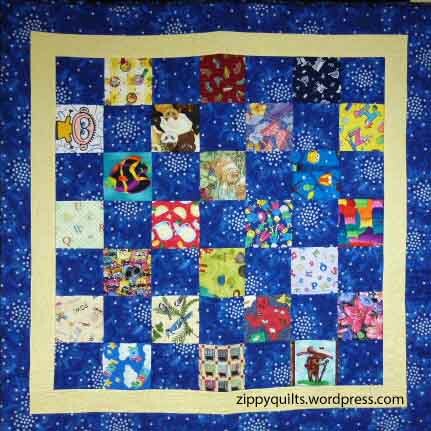 Depending on the arrangement of the blocks you can get a variety of abstract designs when you put the quilt together. The pattern is also great if you need a quilt in a hurry (like if you forgot about a baby or bridal shower). There are lots of other “Turning Twenty” patterns available now, but “Turning Twenty Again” remains my favorite. You can check out Tricia’s designs on her website, or visit her facebook page or blog. Last weekend was Father’s Day, so it’s time to start thinking of a quilt to be made for the appropriate man for NEXT Father’s Day. Here are some man-quilt ideas (modern, of course). Make it big enough to cover him for a nap. 60” x 72” is about right but modify depending on his size. It doesn’t have to be in dark “masculine” colors; consider his favorite colors. If he likes yellow, a yellow and black quilt will still look masculine (just don’t make it yellow duckies). There are a lot of fun novelty fabrics appropriate to masculine interests—everything from Alexander Henry’s pinup girls to power tools, beer, and many more. To use stash, consider simple patterns that make interesting abstract designs. For example, Yellow Brick Road is an easy pattern that can use up a good amount of stash. Start with 1 to 1-1/2 yards of focus fabric and add enough fat quarters of other fabrics to make your quilt. Make enough blocks to leave off the border and it instantly looks more modern. Of course, you can always just let him choose from among the quilts you’ve already made. My husband saw this one when I was piecing it and asked for it! I was very pleased that he liked it, so of course it is his now! Donation quilts are a great use for scraps, but they aren’t usually very exciting to make. I make them more interesting by trying something new with each quilt. Most donation quilts are smaller than bed size, which makes them a good place to try new things. Here’s an example where I “tweaked” the usual quilt design in several ways to make it more modern while still using older fabric from my stash. First, this is a typical donation quilt. It’s made 40″ x 40″ as requested by the charity, and it used up a fair number of those 5” charm squares that seem to reproduce themselves while the fabric closet door is closed. I used it to practice some of the quilting designs I’m learning in Leah Day’s Craftsy class, so I did learn something in making it. And here’s what I decided to do on the next donation quilt for a children’s charity to make it more modern. The blocks are rectangles rather than squares. It didn’t use up any charm squares, but it did use come cute fabric I’ve had for a while. The quilt was designed without a border. If you’d like to make a quilt like this, I’ve made a separate page with instructions; click on this link. If you make a quilt from this, send me a picture! This is “Rising Star”, a quilt I made for the Quilt Alliance “Twenty” contest. The contest celebrates the organization’s 20 years of existence. If you don’t know about the Alliance for American Quilts, headquartered in Asheville, NC, visit their website here. This design had been in my head for some time (OK, years) but I hadn’t gotten around to making it up. The contest seemed like a good opportunity. I had some solids I’d recently bought for another purpose (oops) and they were perfect. I did a bunch of drawings to scale on graph paper then constructed a complete star and quilted it. Only then did I overlay my 20″ x 20″ cardboard frame to mark and cut the quilt to size with the star off- center.. I like it so much I think I’ll make a series of off-center star quilts, probably most of them lap quilt size rather than art quilt size like this one. Having done it once, I’m no longer hesitant to enter a contest. I’m still making quilts for fun, but I’ll share them more, both in shows and on this blog. What about you? Next week’s post will be a pattern for a modern donation quilt. Come back next Sunday!